SCVHistory.com LO8802 | Tejon Ranch | Indian Home and Orchard, 1888-1900. 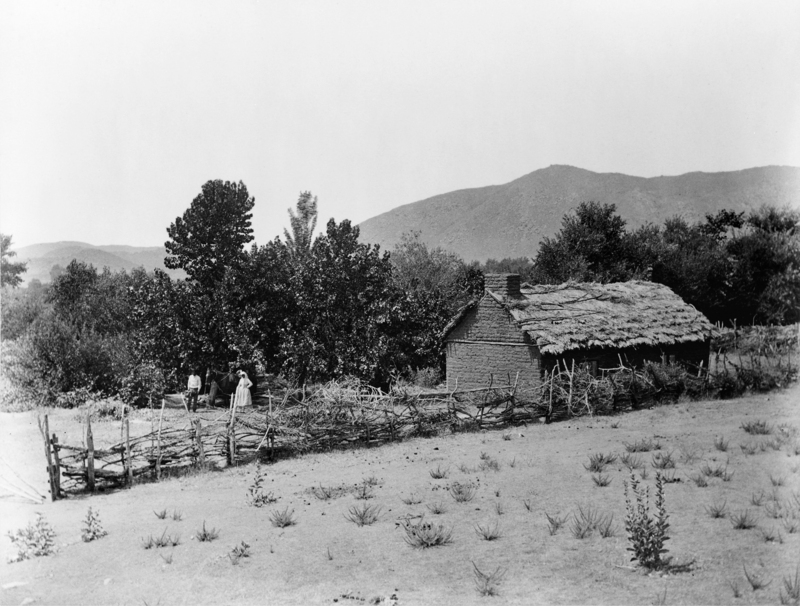 "Indian home and orchard" on the Tejon Ranch, 1888-1900. Image by the famous Western photographer Carleton E. Watkins (1829-1916) in the Library of Congress (Watkins photo No. W534). Photo shows a Native American man and woman in Western attire, with their horse, in front of their adobe-brick home. Their tribal affiliation is unknown. The couple probably stayed behind after the closure of the San Sebastian (aka Tejon) Indian Reservation and worked for landowner E.F. Beale's ranch foreman, José Jesús López. LO8802: 9600 dpi jpeg from tiff. Copy print also on file.